Susannah Charleston shares the adventures with her search-and-rescue dog, a Golden Retriever named Puzzle, and chronicles the close relationship they forge as they search for the lost. This is the humorous, sometimes sad, and eventually uplifting story of Ralph and the friends he has met along the way. He is a rescue dog with a difficult past who loves other dogs, is frightened of people and cars and mesmerized by cats and rabbits. It is partly told through his eyes and describes how what he has experienced before has affected how he interacts with those around him. The remarkable true story of Wylie, a dog who endured horrific cruelty in Afghanistan and survived against the odds to become top dog at the 2014 Scruffts ‘Family Crossbreed of the Year’ competition. 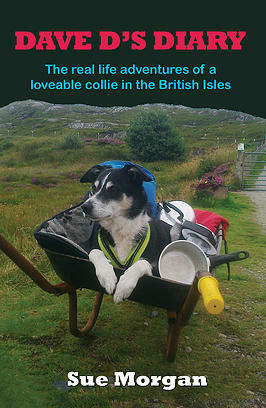 This is a biography of a very special dog. The moving and inspirational story of the friendship between one boy and his dog. The undisputed canine star of multiple-award-winning movie The Artist tells all. From his humble beginnings as a pound-bound hound, Uggie confesses to his youthful misdemeanours , before taking the reader on a page-turning journey through his career as a Jack Russell pin-up, star of numerous commercials, and bit-part player in several B-list movies. Poppy is Fiji’s most famous dog and her amazing journey has helped to highlight the desperate plight of animals in Fiji. A story to warm the hearts of all dog lovers… This is the story of the K9 Project. The desire for connection is a fundamental human need, and for some the closest they come to feeling connected can start with a dog. Dave D’s story is one of overcoming fears, embracing opportunity and jumping at any chance to go on a new adventure. Do you believe in second chances? Real Dogs Don’t Whisper book is about second chances and miracles. Award winning, Real Dogs Don’t Whisper is more than a book about dogs – it’s a book about life. Dogs Were Rescued (And So Was I) is the poignant yet hilarious exploration of how you move forward when you’ve done everything you can and it’s still not enough.